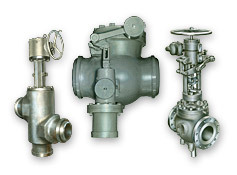 S&K Valves are designed to give minimum pressure loss consistent with the type of valve and service conditions. Full channel areas, partitions included in the direction of flow, elimination of obstruction guides through body and seat, and ample disc lift, all contribute to a low pressure drop for normal flow rates based on valve size. With more than 100 years’ experience in research, design, and construction in the valve industry, S&K continues to support the thousands of custom Valves currently in the field and continues to manufacture Valves to the process and power industries. Reverse flow prevention in process line; Turbine protection as bleeder non-return valves for electric utilities; Feedwater heater bypass; Steam turbine start-up and shut-down; Steam turbine emergency protection; Isolation of oil coolers in power plant systems; Equipment protection from over-pressurization; System protection from pressure surges.